Minneapolis, MN, USA – It was raining this morning as His Holiness the Dalai Lama left his hotel to visit the campus of Starkey Hearing Technologies. Co-founder Tani Austin and her sons welcomed him on arrival and escorted him into the facility where Bill Austin was ready to show him around. 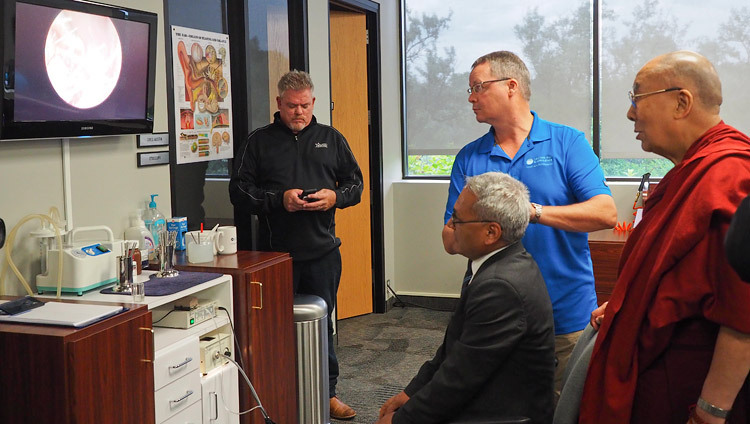 His Holiness observed as a couple of members of his entourage had their ears checked—a process clearly displayed on a screen—and preparations were made to treat them. In the meantime, he and Bill Austin discussed the crucial importance of hearing in language and human communications. In his address to 2000 Starkey employees, His Holiness mentioned that he had first met Bill Austin on a previous visit to the US and that subsequently Austin had come to visit him in Dharamsala. He expressed admiration for the work he, and they, are doing to help people improve and recover their hearing. “All of us 7 billion human beings want to live a happy life. When we’re children we need and value our parents’ affection, but as we grow up we seem to increasingly neglect it. Our education system tends to set material goals, paying little attention to basic human values. “All our religious traditions convey a message of love, tolerance and forgiveness, self-discipline and contentment. Follow such teachings should make us compassionate, but today we are aware of people who quarrel, fight and even kill in the name of religion. Our education system gives little guidance about love and affection despite what we 7 billion human beings have in common. We are born the same way, brought up the same way and we die the same way. “Scientists indicate that basic human nature is compassionate and that a healthy mind is important for our physical health. Since loving kindness is the basis of a happy life, I make it my number one commitment to promote awareness of the importance of warm-heartedness. Nobody wants problems and yet many of the problems we face are of our own making, because we dwell on such secondary differences between us as race, colour and faith. His Holiness explained that his second commitment is to promoting inter-religious harmony. The sad divisions some people make on grounds of religion are an extension of the division between ‘us’ and ‘them’, which is so often the basis of exploitation, bullying and violence. He acknowledged that there are philosophical differences among religious traditions—many focus on serving a creator, others lay stress on the quality of our own actions, but the common goal is to develop compassion, the idea that helping others brings benefit, while harming them brings grief. The first person in the audience to put a question to His Holiness wanted to know how to be a better person each day. He answered that just as when your immune system is strong you fend off viruses and other infections, if you have a healthy mind you can fend off destructive emotions like anger. When a questioner asked what to do in the face of so much war and trouble in the world, His Holiness was clear that the impulse to try to solve problems by use of force is out of date and old-fashioned. He declared that since we are now all so interdependent, the appropriate solution is to engage in dialogue—it’s something to which we can all contribute. He reiterated his admiration for the spirit of the European Union that has preserved peace among its members for 60 years. He also reminded his listeners that since America is a leading nation of the free world, they should keep in mind that democracy, liberty and equality remain critically relevant today. Finally, musician Gene Simmons reported that he had come to hear His Holiness because his 92 year old mother, a holocaust survivor, to whom he always listens, had told him to. His Holiness thanked him for his encouraging remark and replied that he too regarded his mother as his first teacher of kindness and compassion. 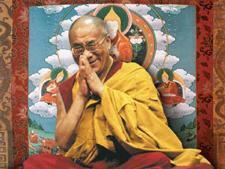 Tomorrow His Holiness will take part in a panel discussion of kindness and compassion.